This workshop will be a continuation of the form taught in June. The session will be geared towards those who already learned Part I of the form. Now that the students have had experience working with a broadsword, we will be able to teach the form much more quickly. We plan on making significant progress learning the form in this workshop. Please plan on attending if you wish to be a part of the performance team during the upcoming Lunar New Year performances. We will be reviewing Part I of this form during this Saturday’s class, so please plan on coming to train. Please sign your name on the sign-up sheet at the Academy if you plan on taking the workshop. 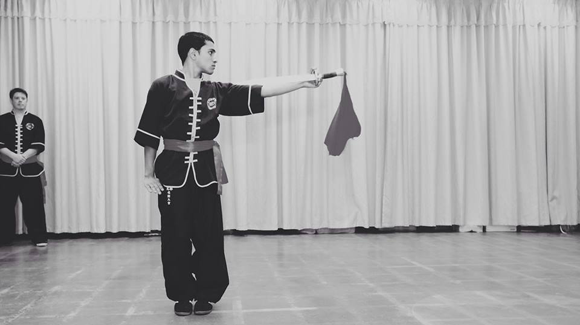 In this workshop, we will teach a Group Wushu Broadsword Form. Everyone is eligible to take this workshop, but the younger students will likely have a much harder time learning this form. The form will be taught relatively quickly, and students’ outside practice is expected. We plan on making a team of 4 or 6 students and turning this into a performance form which can be done during Lunar New Year shows and even in competition. If you wish to take this workshop, you will need to have your own Wushu Broadsword. Our school carries adult sizes, but Kid sizes will need to be bought online. The sword should be approximately one arm’s length; i.e. the length from the fingertips to the torso when measured under the arm when sticking out to the side. If you need help sizing yourself or your kids, please ask an instructor for help. Here is a link to buy the sword. We recommend not purchasing the “Super Grip.” It is better to buy a ‘not too sticky’ tennis racket grip and wrap the sword handle yourself. For more information, please talk to an instructor. We will have a sign up sheet in class to see who is interested in taking the seminar. No Comments to "Wushu Broadsword Workshop II"